This is one of a series of articles I wrote for the monthly Bulletin of Peninsula Temple Sholom in Burlingame, Calif.
Did you know that more than one-third of all U.S. Jews identify with the Reform Movement — and that Reform is, by far, the largest Jewish denomination? Did you know that 55% of U.S. Jews raised within the Reform Movement stay Reform? Did you know that social justice, a cornerstone of Reform Judaism, is of high importance to American Jews? Did you know that 94% of U.S. Jews say they are proud to be Jewish? Did you know that three-quarters of U.S. Jews say they have “a strong sense of belonging to the Jewish people”? Those are some of happier findings from “A Portrait of Jewish Americans,” a major report released by the Pew Research Center on October 1. This study has galvanized conversations in the Jewish world, and in particular in the Reform movement’s three main pillars: the Union for Reform Judaism, the Central Conference of American Rabbis, and Hebrew Union College-Jewish Institute of Religion. Of Jews in the youngest generation of U.S. adults – the Millennials – 68% identify as Jews by religion, while 32% describe themselves as having no religion. Only 15% of U.S. Jews say that being Jewish is mainly a matter of religion; 62% say that being Jewish is mainly a matter of ancestry and culture. Only about a third of Jews who say they have no religion are raising their children Jewish. It’s gratifying that 35% of all U.S. Jews identify with the Reform movement. By contrast, 18% identify with Conservative Judaism, 10% with Orthodox Judaism and 6% with smaller groups like the Reconstructionist and Jewish Renewal movements.The rest say they do not identify with any particular Jewish denomination at all. For progressive Jews, synagogue membership is low and declining. 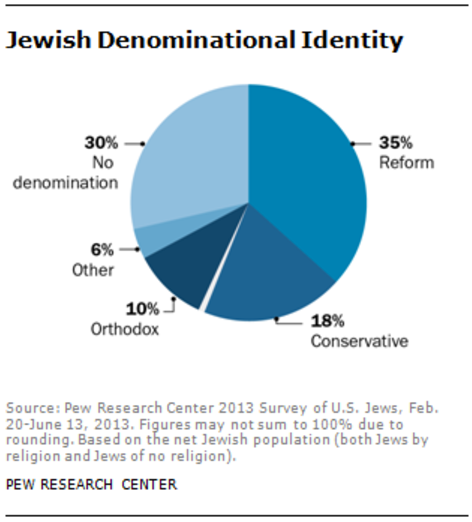 34% of Reform Jews belong to a synagogue. 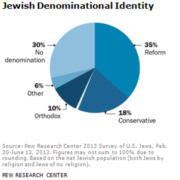 By contrast, 50% of Conservative Jews, and 69% of Orthodox Jews, belong to a synagogue. Reform Jews are generally less involved in Jewish life than Conservative or Orthodox Jews, and less supportive financially. 60% of Reform Jews have donated to Jewish organizations in the past year, compared to 80% of Conservative Jews and 92% of Orthodox Jews. A controversial part of the report covers the increase in interfaith marriages. For Jews who married before 1970s, 17% have a non-Jewish spouse; for those who married in between 1980-1984, that jumped to 42%; and for those who married since 2000, 58% married out. To go along with that, 96% of Jews who have a Jewish spouse say they are raising their children as Jewish by religion. Of those in interfaith marriages, only 20% say they are raising their children Jewish by religion. No matter how we quantify couples, the study clearly indicates that intermarriage has changed the Jewish community. The growth of “Jews of No Religion” (currently estimated at 1.2 million) may be influenced by the rise of secularism in the United States, but its most important factor is the growing number of Jews with mixed ancestry. While some will bemoan this number, I consider it a positive development: Many people with mixed Jewish-Christian ancestry are still proud enough of their Jewish heritage to identify themselves as Jews to a stranger on the phone. Not all people of mixed ancestry are willing to cast their lot with the Jewish people in this way, as we see in the much larger number of Americans classified as “of Jewish background,” estimated at 2.4 million. We also see the effect of intermarriage in the percentage of respondents who are not white. Jews who have black, Asian and other ethnic backgrounds are not only the products of intermarriage; many have converted, and some have long Jewish lineages. But the numbers — 5% of Jews by religion, 12% of Jews of no religion, 32% of people of Jewish background — point to the central role of intermarriage in the increasing ethnic diversity of American Jews. Findings like these focus our attention on the growing diversity of the Jewish community. In short, Pews’ “Portrait of Jewish Americans” reminds us there is no such thing as a typical Jew. There’s no good answer, in part because there’s no consistent definition of what it means to be Jewish for these research studies. Do they count those who follow matrilineal descent, which is important for Orthodox and Conservative Jews? Do they count everyone who self-identifies as a Jew? Or who live in a Jewish household? Or secular Jews who are unaffiliated? There’s no commonality. However, it’s clear that low rate of synagogue affiliation, particularly among Reform Jews, creates challenges everywhere. As we continue to debate the best communal responses to the Pew study, I believe we must not give up on those Jewish Americans who do not fit into the organized Jewish world’s neat binary categories: affiliated/unaffiliated, religious/cultural, committed/uncommitted, lovers of Israel/critics of Israel. The truth is more complex and the Jewish future will be brighter when we learn to broaden and deepen the Jewish tent. The professional and lay leadership of Peninsula Temple Sholom are following the discussion around these studies closely, trying to understand what they mean for our congregation — and our community. With our focus on Sukkat Shalom and Relational Judaism, our warm embrace for interfaith families, and our initiatives to take action to promote social justice, we believe that PTS is well positioned for the future. That does not mean that we are complacent. Early this year, PTS hosted a symposium of Reform Judaism in the West, and in September we brought in Dr. Ron Wolfson to help our lay leaders strengthen our beloved congregation. The board has learned a lot, and will continue to research, study and think about long-term and short-term actions. One new initiative, focused on building community and driving social justice, is Kolot: Connecting Our Voices. Learn more and sign up at http://www.sholom.org/kolot. I’d love to hear your thoughts about the Pew study, the Brandeis study, and the future of Reform Judaism in the Bay Area.